We have just been to see cloudy with a chance of meatballs, we went to see it in 2D as not that keen on the 3D versions. 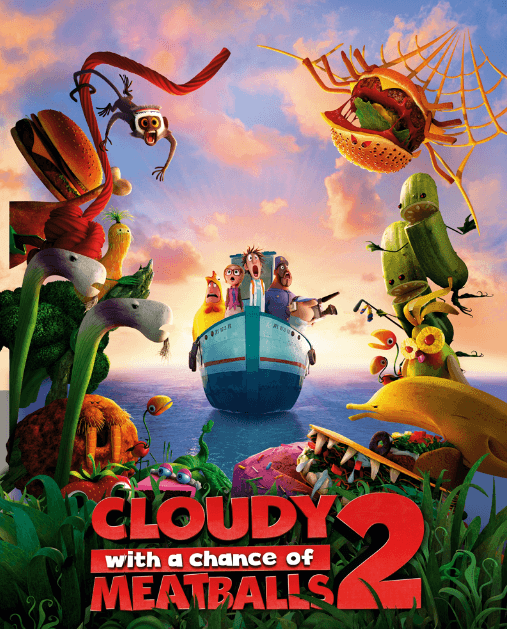 The whole family loved the first cloudy with a chance of meatballs, the sequel follows on from the first film with the main character Flint Lockwood whose invention FLDSMDFR (The Flint Lockwood Diatonic Super Mutating Dynamic Food Replicator) had produced all the food and that had supposedly destroyed in the first film. The story is based and the live Corp run by Chester V a childhood investor hero of Flint. This character seems to me that he is based around the late Steve jobs from Apple. Who is a full than life character. After the main character are relocated from Swallow Falls for a clean up of the island they return to turn off the FLDSMDFR with a special BSUSB stick. This is were the main fun of the film begins with all the different type of food imams, which is food that is alive like normal animals. Two of my favorites are the chesspider which is a cheeseburger that looks like a spider with French fries as legs and also Barry the strawberry. We really did enjoy this sequel though the story I don’t think is as good as the first one, but the dazzling visuals and all the jokes make it well worth watching. I would give the film a rating of 4 out for 5, mainly for the kids but adults will enjoy it also. Running time is 1hr 35mins Directed by Cody Cameron, Kris Pearn And stars Bill Hader, Anna Faris, James Caan, Will Forte, Andy Samberg, Terry Crews.